Studio Murter 5117a presents accommodation in Murter. Certain rooms have a seating area to sit back in after a busy day. All rooms are equipped with a private toilet fitted with a bath. 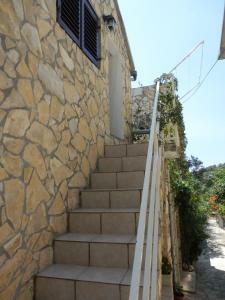 Zadar is 45 km from Studio Murter 5117a, while Sibenik is 25 km from the property. The closest flight terminal is Split Airport, 64 km from the property. Kuca Viktorija ~0,1 km, Murter price per day from € 70 Some units feature an outdoors terrace and/or patio with sea or town views. There is also a kitchen, fitted with an oven and fridge. Every unit presents a private toilet with a shower. You can play tennis at the property, and the area is famous for horse riding. Apartments Lavandis ~0,1 km, Murter Situated in tranquil countryside on the Island of Murter, Apartments Lavandis provides self-catering accommodation. A pebbly beach is 350 metres away from the property. Apartments here come with a TV and ironing amenities. A patio or an outdoors terrace are at the guests' disposal at Lavandis Apartments. The centre of the town of Murter, with its coastal promenade and café clubs, is 1 kilometers away from the apartments. 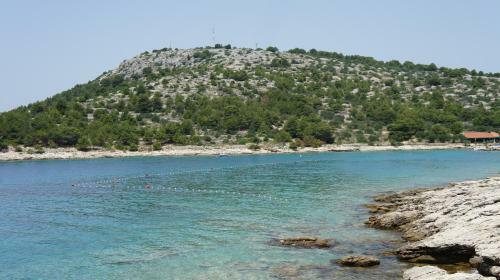 Tisno ( ~ 3.9 km ): 206+ accommodation units. Beach Cigrada, Murter ~ 0,7 km from Studio Murter 5117a Sandy beach: ideal for families, recommended for young people, with restaurant, with caffe bar. Excellent choice of watersports. Beach Zdrace, Betina ~ 1,2 km from Studio Murter 5117a Gravel beach: ideal for families, recommended for young people, equipped with showers. Excellent choice of watersports. Beach Slanica, island Murter ~ 1,4 km from Studio Murter 5117a Sandy beach: ideal for families, recommended for young people, with restaurant, with caffe bar, equipped with showers. Excellent choice of watersports. Beach Luke, Murter ~ 1,4 km from Studio Murter 5117a Concrete beach: ideal for families, recommended for young people, with restaurant, with caffe bar, equipped with showers. Excellent choice of watersports. Beach Plitka Vala, Betina ~ 1,6 km from Studio Murter 5117a Sandy beach: ideal for families, with restaurant, with caffe bar, equipped with showers. Excellent choice of watersports.